When implementing a network application which provides several network services such as Web server (HTTP, HTTPS), Corba, JMS, we may think about how these services will be published. The natural way of publishing different types of services - is to make them available on separate TCP ports (one TCP port per service). Usually HTTP is published on port 80, HTTPS 443, and so on. There might be no problems with that approach; the service consumer just must remember its own TCP port number, but sometimes, due to certain admin restrictions, we’re not able to make all the required TCP ports available for the external consumers on Internet. What if we’re limited just by one TCP port accessible for the external (Internet) service consumers? For that case, we have to have a solution which let’s us share a single TCP port among different services and, depending on incoming service request, redirect it to the corresponding service. This solution is called Port Unification. 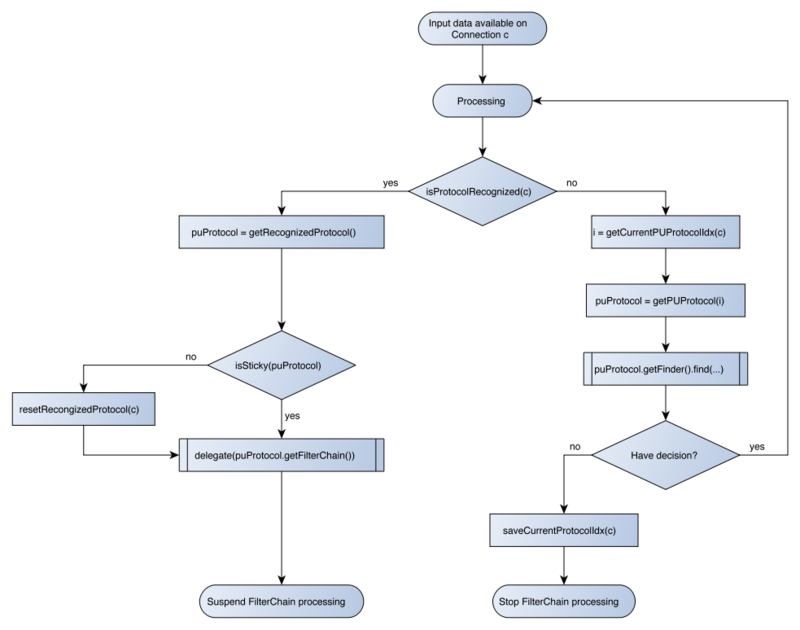 Port Unification, in Grizzly, is represented by PUFilter which is a Grizzly 2.3 FilterChain Filter. This filter plays role of a fork in the FilterChain. FilterChain, represents specific protocol FilterChain. For better usability, Grizzly Port Unification introduces the PUProtocol abstraction, which holds ProtocolFinder + FilterChain pair. The picture above is not complete, one piece is missing. We can imagine how new data comes from network, comes into main FilterChain, it redirects it to the corresponding protocol FilterChain. return bytesToCompare == magic.length ? Complete sample code could be found here.